I've finally tackled and completed the dreaded console wiring!!! It would be an understatement to say that wiring up the console is my least favorite part of this whole project. It's NOT terribly difficult and easier than when I did my own as I made wiring diagrams to follow...but still it's a whole bunch of little bitty things getting hooked up in a relatively small space. 1) 110 volt AC that powers the three boiler heaters, the hour meter, amp meter, pilot light and internal ventilation fan. It is connected thru a 15 amp fuse, master switch, three separate heater control switches and a dimmer switch for additional fine control of one heater. Heaters in total put out 1600 watts. The AC wires can be seen in the above photo as heavy black, white and a green grounding wire. 2) 0-25 volt DC generator circuit that powers the lamp post by the boiler face, lamp post to the left of the generator pod, saw motor/lamp combination, a volt meter and a continuous on DC milliamp meter as well. 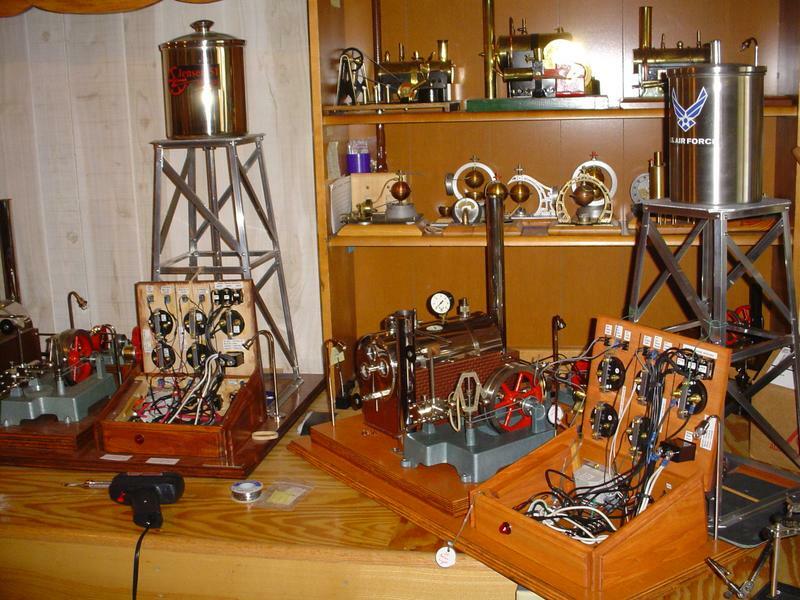 Each of the lamps and motor are switchable. 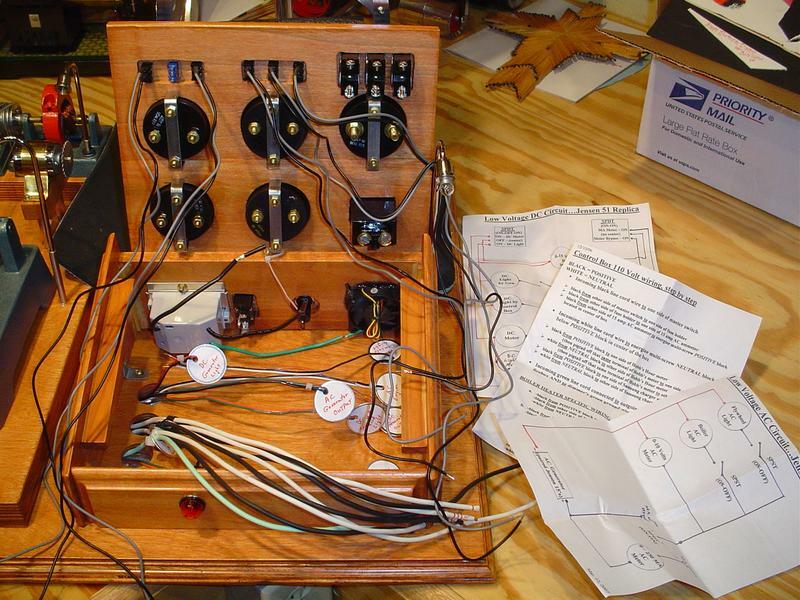 3) 0-6 volt AC generator circuit that powers the lamp post mounted by the engine, lamp post shining on the console face, a volt meter and a milliamp meter. 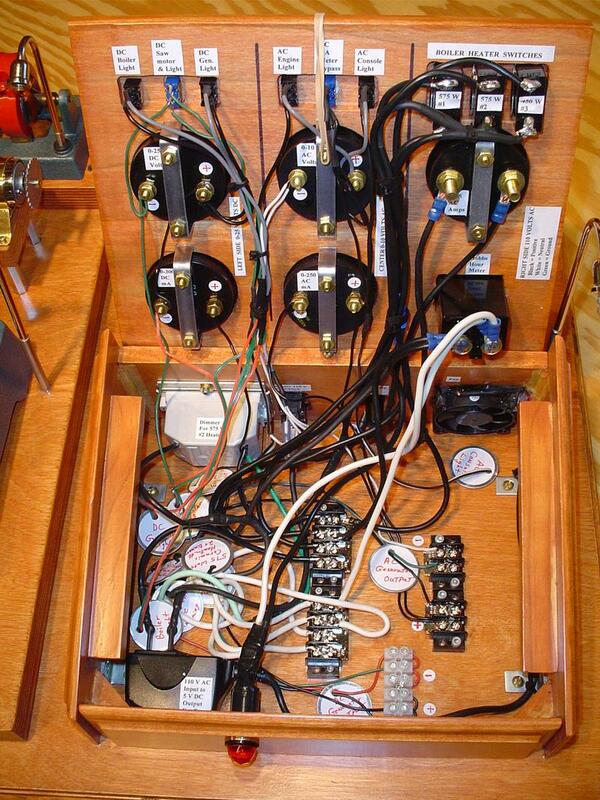 Each of the lamps and milliamp meter are switchable (meter to reduce draw). For inspiration and to double check I was doing it right, I opened up the console of my 51R and positioned both units side by side for the duration of console wiring. I hate to admit it, but it took better than 8 hours over several days to finish this and hopefully it will all work when I fire it up...if not, the console top opens easily if I got any wires crossed, but I'm fairly confident it will turn out fine. Here is the console now completely wired and labeled as of April 27th.